Negative Equity - What Does It Mean? What is "negative equity"? 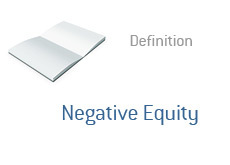 What is the definition of the term "negative equity"? The term "negative equity" has been used considerably more in the media since the collapse of the US housing market. "Negative equity" simply means that you owe more for something compared to what it is worth. Example: You take out a $450k mortgage to pay a house that is listed for $500k. Thanks to a large decline in real estate values in your area due to a number of major companies packing up and leaving town (and taking their jobs with them), the value of your home drops $150k in just two years. You now have an outstanding mortgage on the property of $440k, but the home is valued at about $300k. You owe about $140k more than what the home is worth, meaning that you now have "negative equity" in the home. Most people who find themselves in negative equity situations are obviously stuck, but selling the home would mean incurring a large loss. If the person in the example above decided to sell their home, then they would be forced to pay about $140k to the bank to make themselves whole on the loan, which is obviously not an option for most people. The decline in real estate values in the United States created millions of "negative equity" situations around the country, meaning that many people are stuck in their homes, as they are unable to eat any losses that would be incurred if they decided to sell their homes. During the "boom" days of the US real estate market, negative equity situations were basically unheard of. Home values were increasing so quickly that people were basically "in the money" as soon as they purchased their homes. Even some long-time homeowners (people who have owned their homes for a long period of time) have found themselves in negative equity situations due to HELOC loans (Home Equity Line of Credit).